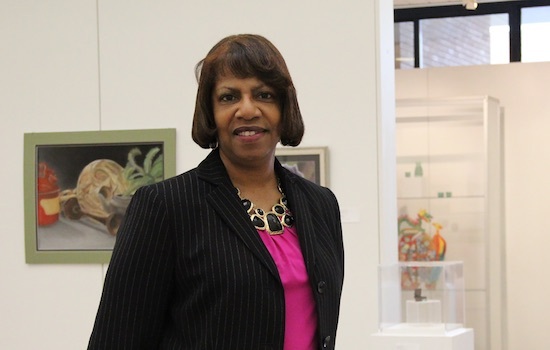 Twyla Cummings has been named dean of Graduate Education at Rochester Institute of Technology. Cummings, who has been serving as senior associate dean for graduate studies and faculty research in RIT’s College of Imaging Arts and Sciences, was chosen after an extensive internal search. She assumes the dean’s chair on Aug. 1. “I was particularly gratified by the pool of extremely well-qualified candidates and am pleased that Twyla has accepted the position,” said Jeremy Haefner, RIT provost and senior vice president for Academic Affairs. “Twyla is committed to enriching the graduate student experience, as well as growing the graduate student body." Cummings has had a distinguished career, including 17 years at RIT. She has served as a professor in RIT’s School of Media Sciences, teaching and researching in the areas of media distribution and print industry trends. She was also appointed the Paul and Louise Miller Distinguished Professorship and worked as a graduate director for the print media program. In her field, Cummings is a frequent speaker on critical developments in post-press and issues impacting the graphic communication industry. Cummings was the 2015 Naomi Berber Memorial Award winner from the Printing Industries of America. Sponsored by the organization’s Ben Franklin Society, the award honors outstanding women in the graphic communications industry. In 2013, she was inducted into the print industry’s Women of Distinction program, sponsored by the OutputLinks Communications Group, a global marketing and publishing firm. She was also the recipient of the 2014 Isaac L. Jordan Sr. Faculty Pluralism Award—given annually to an RIT faculty member who has made a significant contribution to diversity efforts on campus and within the Rochester community. Additional community honors include the Rochester Women’s Network 15 Up and Coming Award; induction into National Association for Printing Leadership’s (now EPICOMM) Walter E. Soderstrom Society; and extensive roles with the YWCA. In addition to earning a Bachelor of Science degree in chemistry and a master’s degree in business and industrial management from Wright State University in Dayton, Ohio, Cummings earned her doctoral degree in business management from Union Institute and University in Cincinnati. Cummings is replacing Hector Flores, who has taken on the role of president at the South Carolina Governor’s School for Science and Mathematics. RIT’s Office of Graduate Education collaborates with college deans, faculty, staff and students, at RIT’s home and international campuses, to advocate for graduate education and the needs of students. RIT has about 3,200 graduate students enrolled in more than 100 graduate programs. RIT’s eight Ph.D. programs include astrophysics, color science, computing and information sciences, engineering, microsystems engineering, imaging science, mathematical modeling, and sustainability.